I was planning my next US trip again when I did the usual rounds of making phone calls and getting quotations. My first stop would invariably be Northwest Airlines. I have been flying with them for the last 6 years and rightly so for a very good reason. They give the best value of money but only if you navigate strategically and strike that optimal balance between cash and frequent flyer points. If you are looking at a straight forward economy return ticket to the US. Northwest Airlines' discounted economy fare (around HKD 4,000) has consistently been the most competitive. However, the same cannot be said the same for Business class fare (around HKD 34,000). I am at the point where my travel budget allows me to be somewhere in between i.e. Full Fare Economy (around HKD 12,000). One may ask if discounted economy is so cheap (less then half of full fare economy at times), why bother with full fare economy? The answer is simple. Only with full fare economy am I allowed to use my frequent flyer points to upgrade to business class. Full fare economy is around half of a full fare business. In other words, I can get a business class seat at half price (+60,000 points). Pretty good value for money if you ask me. I have never had trouble getting the points for NWA has always been rather generous with the points. The 125% bonus for Platinum Elite is just additional cherry on top. However, there is a catch to this. Upgrades are subjected to availability i.e. I may pay full fare economy and still end up in economy. It is quite a bit of a gamble in the sense that you won't know if there are available upgrade seat up to the day of the departure itself. You need to buy a full fare economy ticket and then hope for the best. In a way, there is a pecking order as to who gets the remaining business class seats. After all the fare paying business class seats are taken, the balance are then made available to the various upgrade passengers. Within the upgrade passengers, we are ranked by our elite member status so as to determine who would be the lucky passenger to get the last available upgrade seat. I would say with the Platinum membership, I tend to get quite far ahead in the waiting list. However, when the planets are aligned, die die no upgrade seats means no upgrade seats and one would be better off just getting the discounted economy fare. Sadly the enlightenment is always the result of a 20-20 hindsight. In the beginning, I almost have no trouble getting my upgrades but in the past 2 years, they have becoming more and more frequent. I was most infuriated when after paying full fare economy, I could not get upgraded due to the business class being full, or so I was told. Imagine my shock when I saw more than 20 empty seats! As I encountered more and more of such occurrences, my loyalty is starting to wane and this recent quote of HKD 17,000 is probably the last straw. Frigging HKD 17,000 for an economy seat with no guarantee of an upgrade. I have to be mad if I were to book that ticket. Anyway, I trawled the websites and I found Thai Airways offering Business Class at HKD 21,000 (I presume it's a discounted business class ticket but who cares?) and if I may add, a guaranteed seat in business class. Granted that Thai Airways, being a partner airline of the Star Alliance i.e. the points earned will not do my Northwest Airlines (SkyTeam) any good, it no longer matter if you are no longer loyal to any particular program. Anyway this is my travel strategy going forward. Fortunately, it coincides with my plan to scale down my number of trips to the US from 6 to just 2, thus I can afford to fly discounted business class with whichever available airline and still spend less per year. At 970,000 miles, I am 1 US trip away from hitting the million-mile mark (NWA calls it the Million Air Club) with Northwest Airlines from which I would be award a lifetime membership at Elite Gold tier. I no longer care anymore. hmm.. would you consider about compromising for safety rather than the qualities that they have given? Gary: I think you will have to rephrase that question coz I have no idea what is it that you are trying to ask. this qn have little bearing towards the post.. would you still choose for upgrades and compromise safety?? Gary: Since when has I compromised safety? Sorry dude but you lost me there. Gary: I don't think there is a choice between upgrade and safety. Safety is not an option to begin with. I think he was trying to say that maybe Thai Airways not as safe as Northwest given the track record or the consumer perception (nudge nudge) of the different airlines? Jay is right to say that safety cannot be compromised no matter how much or less you pay for the airfare. But Thai Airways has been trying to improve... so give them a chance lah. (btw I keep forgetting my password. ARGGH. Barffie: If I may direct you to this website @ http://www.planecrashinfo.com/rates.htm, how safe an airline is quite subjective except for the bloody obvious Indonesian airlines and the Ta1wanese Ch1na airlines. Yes, Northwest Airlines ranks above Thai Airways which in turn ranks above Singapore Airlines/Silkair. Do we think our own national carrier is unsafe? I'd bet you'd say no which consequently saying that Thai Airways also very safe. In each airline's history, Northwest has 4 fatal accidents while Thai and SIA/Silkair has 2 each. Which is safer? Also, if I may add, ticket prices does not equate to safety i.e. cheap budget airlines will be more dangerous? Air worthiness has to be passed before allowed to fly, regardless of whether it is a FSC or LCC. I have been trying all day to join the frequent flyer prog with north west> I am already with Star Alliance. Travel with Thai airways ALL The Time. However, now I will be travelling out of UK instead of Singapore for a while. First .. After reading your long email re... frequent flyer prog for Northwest. Im not impressed. Secondly. Thai airways have a very good safety record. Very hot on security in Thailand itself. Travelled 3/4 times a year with Thai for the last 16 years . Very impressed all round. Excellent frequent flyer prog. Looking for same out of UK to USA. Marie: If you are going to be traveling out of UK, then perhaps OneWorld would be better suited for you as British Airways is a member. BA has always be one of my one favoured airlines. If you have the budget for Business Class, their Club World's lie flat bed seating is simply a delight. Most airlines boast of a 180 degrees flat seat but they always failed to mention that it is at an angle i.e. not horizontal. As a result, this feature proved to be utterly useless as you will find yourself at the bottom of your seat unknowingly, as you slided down during your sleep. If your budget is more modest, their World Traveller Plus aka Premium Economy is also good value for money especially on long haul flights. Without the price tag of a Business Class ticket (though slightly pricier than a regular economy ticket), you get more legroom and recline as well as a footrest for a more endurable flight. 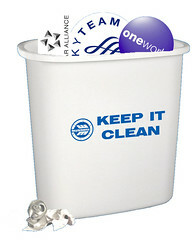 I can't really say the SkyTeam (Northwest) is all bad. Perhaps over time when my own travelling habits are altering, SkyTeam looks less and less suited for my needs and NWA management don't seen to be doing anything about trying to retain these loyal customers who have been with them for years. So do I ditch them? Probably not. No point burning bridges here even though they are no longer at the top of my seek list. For all you know, you may need them again in the future. Marie: As for trans-atlantic flights, it would depend on your final destination in the US. There is a need to know if the final destination is one of a major city or one of the super ulu little town. If it were the former and the prices are around the same, I would recommend avoiding US airlines. US Airlines are known for their lousy serivce. Skytraxx ranked the Big 4, namely American, United, Delta and Northwest, at a mere 3-stars. However, before we write them off totally, they have excellent connections to the smaller cities and we may have to fly with them in order to get to your final intended destination.